What a difference a year makes. A year ago today, on the morning after the Pacquiao-Margarito fight, I hammered out a hurried but heartfelt post entitled “What we can learn from the Empathy, Grace, and Humility of Manny Pacquiao”. Over 200,000 people read it on my site and it was pretty widely republished on some other publications, including the Inquirer and some others. With the beating that Manny has been taking in some quarters since the Marquez fight on Saturday night, I’ve had quite a few people write to request that I republish it. So here it is. It’s not a bad thing for all of us to be reminded of the character of the guy we’re all talking about, as demonstrated a year ago in the fight with Margarito. Another Pacquiao fight — another drubbing of a much larger opponent, and Pacquiao’s legend as a boxer grows. But the fight between Manny Pacquiao and Antonio Margarito produced not just a memorable pay-per-view experience worth every penny of the $64.95 it cost — it produced, for this observer at least, moments of clarity that helped me better understand what makes the Filipino “National Fist” so much more than just a great athlete. First, if you didn’t see the fight but have read about it, you probably have read that Pacquiao dominated; that he won every round or almost every round; that he cut Margarito to shreds so much so that everyone, including Pacquiao, had legitimate concerns about Margarito’s health and whether the fight should continue in the later rounds. That rendition of the fight is accurate up to a point — but it fails to capture the genuine peril that Pacquiao faced in the early rounds, the genuine threat that Margarito represented, and thus the challenge that Pacquiao overcame to prevail against Margarito–a fighter who was in the best shape of his life and weighed 165 to Pacquiao’s 148 on fight night, an advantage of not just 17 lbs but 12% of of body weight–a Goliath to Pacquiao’s David and a disgraced Mexican warrior on an epic quest for redemption. Could Margarito have been more prepared or more motivated? I don’t see how. That’s what Pacquiao was up against. Think it was easy for Pacquiao? Think again. As the fight began, Emmanuel Steward, hall of fame trainer and normally shrewd commentator for HBO said: “I see the size difference — it’s a big factor right now. I see he’s not used to punching at a man as big as this one who seems to be absorbing his blows pretty easily.” Then there was Margarito’s jab — a new weapon — that was touching Pacquiao up in the first round. Steward: “What I’m surprised about is Margarito’s jab, which is a very good move, and that seems at this stage to be the most dominant punch in the fight.” A few moments later, with a minute to go in the first round, Steward said of Pacquiao: “He may have a problem tonight — the physical size seems to be a big factor.” By the time the first round ended Pacquiao had thrown enough punches to win the round — but just barely, and the sense was that he could be in trouble, that he finally might have bitten off more than he could chew. The jab was a problem, the size difference was a problem, and Margarito–a notoriously slow starter–might get stronger as the fight wore on. And that was how it felt after the first two rounds, and much of the third. But as he has so often in the past, Pacquiao — guided by the man he calls his “master” Freddie Roach — gradually began to solve the Margarito puzzle and find ways to use his astonishing hand speed, footwork, head movement, and ring savvy to start slicing his opponent, most notably opening a cut under Margarito’s right eye that almost immediately began to swell, causing the eye to almost close. 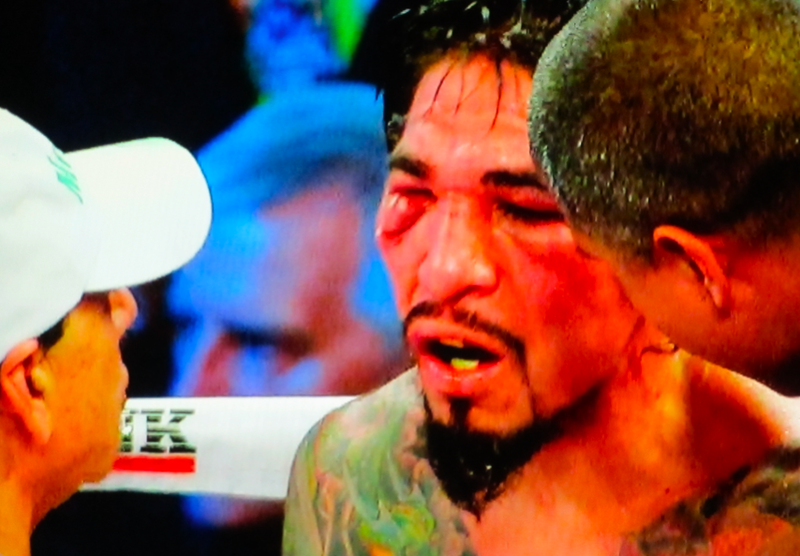 [[Comment: Margarito went straight to the hospital after the fight and it was determined his orbital bone was broken.]] 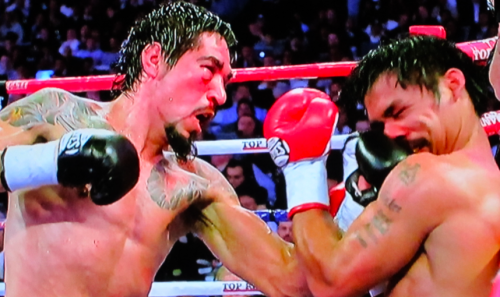 From there Manny gained the upper hand but even after the cut had begun to be a problem for Margarito, there were some nerve wracking moments, notably in the 6th round when Margarito got Pacquiao against the ropes and hit him with a huge left to the liver that buckled Pacquiao’s knees. Later, and more than once, he rocked Manny with uppercuts, most notably one in the 8th round that clearly hurt. Yet in spite of being hurt more than once, Pacquiao dominated; he repeatedly landed power punches that soon had Margarto’s entire face swollen and bleeding and yet Margarito — to his credit as a warrior if not a sensible human — refused to go down and refused to stop. By the 10th round there was ample reason to stop the fight–and Pacquiao glanced at the referee more than once as if to ask, “Shouldn’t you end this?”, and his look was one of concern, not bravado and dismissiveness. Steward at that point commented that while the referee had every reason to stop the fight–he probably wouldn’t because Margarito was still demonstrating his grit by throwing punches even though his punches no longer had snap or power to them, and his eyes were swollen practically shut. To which Kellerman said, rightly: “It’s not about his eyes, it’s about his brain — how many power punches flush to the head can a man take?” And indeed, by the end, the compu-box figures that Pacquiao had landed a disturbing 401 power punches to Margarito’s head — and who knows when the damage from that kind of beating will present itself. Margarito on his stool between the 11th and 12th rounds looked for all the world like Rocky Balboa in the original “Rocky” — both eyes almost swollen shut, punch drunk, but emphatically demanding that he be allowed to continue, to go the distance. All that was missing was Margarito yelling “cut me” to make it a complete reprise of Hollywood’s epic, amped up vision of the outclassed warrior willing to risk everything to still be standing when the final bell sounds. 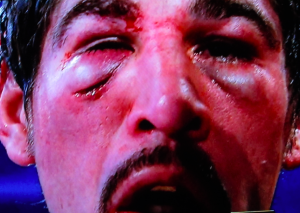 There he was, insisting through his mangled features that he wanted to fight one more round, to make it to the end, and his corner let him do it–a decision that honored Margarito’s epic courage but placed him in epic danger. 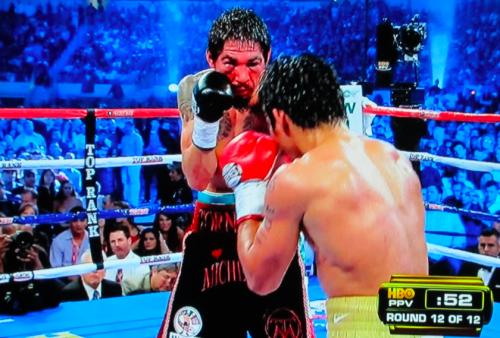 And then it was the 12th round, with Margarito out on his feet and all but defenseless, game but beaten. There was every reason to believe that Pacquiao, hungry for the KO that would put the exclamation point on his performance, would swarm Margarito and either drop him at last, or mount a blistering final assault that would leave the referee with no choice but to stop it. 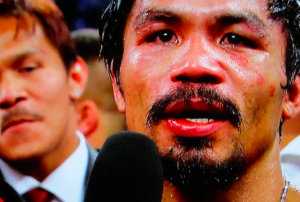 As the fight ended Pacquiao knelt in his corner in prayer as is his custom. I’ve watched Pacquiao do this and each time I’m struck by his body language as he prays – the intensity with which he clutches his gloves to his head, blocking out the crowd, the arena, the chaos around him creating what clearly must be a profound moment of heartfelt religious communion. 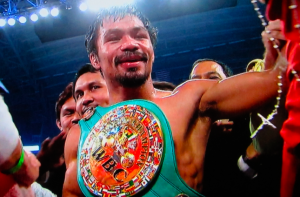 And then, moments later as the championship belt was draped over his shoulders, a smiling Pacquiao immediately looked around for his crucifix – found it dangling from the hand of a handler, then immediately leaned forward, head bowed, placing it around his neck. And then a gracious and amazingly (yet typically) humble post fight interview with Max Kellerman who started by saying: “Manny, that was a pretty big guy you just beat up – what was that like?” Pacquiao: “It’s hard, I really …I mean ….I did my best to win the fight….he’s strong….a very tough fighter. And I can’t believe it.” Kellerman: “What can’t you believe?” Pacquiao: “I mean, he’s very tough and strong and I never expect that.” Who ever heard a boxer be so candid and so humble after such a victory? What other boxer’s ego would allow such statements? Kellerman: “In the 12th round it looked like maybe you were backing off, maybe not to hurt him”: “I’m not looking for a knockout. I want to finish the round. My trainer said take it easy, win the round, just be careful.” Now this is interesting because on the surface it sounds like Manny was just following Roach’s instructions–and indeed I have no doubt that Roach gave the instructions Manny describes. But I think there is something else going on here — he didn’t want to “dis” his opponent by saying that he intentionally let up. Instead, he just left it that his corner told him to win the round and be careful. But everything from the salute to Margarito at the beginning to Manny’s demeanor throughout the round confirms that he was, indeed, “carrying” Margarito to the finish line, giving the warrior his due in the process. The interview finished with Pacquiao saying: “That’s all I can give. I’m trying to make people happy.” For a boxer to say “I want to make people happy” seems overly simplistic on one level — but when you think of where Pacquiao comes from — not just the Philippines, but the mean streets of the Philippines, a place of grinding poverty where there is no escape and where hope is often all but extinguished — the power to “make people happy” is a power that means more than producing a transitory moment of enjoyment. It’s an ability to fundamentally alter that state of mind and heart for people – to lift them up and make them feel that there’s hope, and good things are possible in a tough unfriendly world. For Manny Pacquiao, to “make people happy” is something far more profound and meaningful than it would be if the same statement were coming from an American boxer. Asked about his next moves, Pacquiao replied: “That’s why …. I have another job after this, I’m going back to the Philippines and do my job as a public servant — and I want to help people.” Honestly — much of the time when Pacquiao speaks English you have the feeling that he’s groping for words, that he could be much more articulate in Tagalog — and yet there is a simple clarity to his choice of words — ‘do my job as a public servant’ and ‘I want to help people’. How can you not believe he is sincere — and humble. He’s not just a “public servant” – he’s a congressman, and rightly proud of that. But he always chooses to refer to himself by the term “public servant”, not “Congressman”. There’ is genuine humility–and perhaps a touch of political genius– in that. And then Pacquiao went to Margarito’s locker room, apologized to Margitor’s spouse, and paid tribute to Margarito for his courage and warrior’s heart. Those of us who are connected to the Philippines have followed Manny Pacquiao for many years and we’ve heard him speak and act in this humble, gentle manner — so this in itself is not news for us. But as his fame grows and the rest of the world gradually wakes up and takes notice of Pacquiao as a sporstman who transcends national boundaries and the niche of boxing, hearing him speak this way reminds us that while on the one hand what we see in Manny is unique, in another way it is not, because what is on display when Pacquiao speaks is essential Filipino values that typify the elusive best of a country whose people’s humble and gentle virtues are not particularly well understood abroad. This is, after all, a world where, for example, some cultures have adopted the term “filipina” to be slang for “housekeeper”. The truth is, it’s easy for ill-informed westerners to underestimate and misinterpret the gentle, gracious nature of the Filipino character — yet somehow Manny Pacquiao is singlehandedly changing that, teaching the world and reminding the Philippine universe that humility, grace, compassion, and empathy can coexist with the heart of a warrior. Yet even if Filipinos instinctively understand the meaning of Manny Pacquiao better than we foreigners — they have been traveling on a learning curve with Pacquiao as well. Remember that Pacquiao’s popularity in the Philippines, great as it is, did not automatically win him a berth in Congress. He ran previously, two years ago and lost badly. Some said the loss reflected what was in essence a cynical “no” vote from an electorate who wanted him to keep fighting; others inerpreted the “no” as a desire keep Pacquiao from becoming tarnished by the dirty nature of Philippine politics. Either way, Pacquiao lost, and it wasn’t a split decision — it was much closer to a political knockout. But he didn’t give up, he showed patience and sincerity and above all perserverence, and throughout it all he continued to talk compellingly about his real reasons for doing it — and along the way many of the skeptics who saw in his first run for Congress a questionable act of celebrity ego began to gradually come to understand that it was another impulse, the impulse toward genuine and sincere public service, that was driving Pacquiao. And so now he has the position he sought — the position of “public servant”, and he has stated that his goal is to become a “champion of public service” as his life transitions toward a new phase. Boxing has been his vehicle to “make people happy” in one profound, “let me lift you up” way that Filipinos perhaps understand better than the rest of us. That phase will end. But now, today, he is an elected Congressman who through both his boxing and public service has truly has made millions of people happy in that transcendant way he seeks–so truly and so beautifully happy that the result may be that the skinny kid who grew up on the streets may well someday have the opportunity to lead not just an impoverished Sarangani province, but an entire resurgent nation that with Pacquiao as example-maker-in-chief. Could it be that a long-suffering and self doubting country might, under his inspired leadershp, find the courage within itslef to lift itself up as a country in ways that would be just as surprising, yet just as inevitable, as Pacquiao’s rise to the top in boxing. I for one believe in Manny Pacquiao–his heart, his sincerity, the sheer power of his will, and the true Filipino essence of his character. He makes me feel hope for the future of the Philippines, and proud to be the American half of a Fil-Am marriage and the father of children who have Filipino blood flowing through their veins. Thanks for sharing. Your post is a useful contnibutior. Dear Manny Pacquiao, the "Man in the Arena"